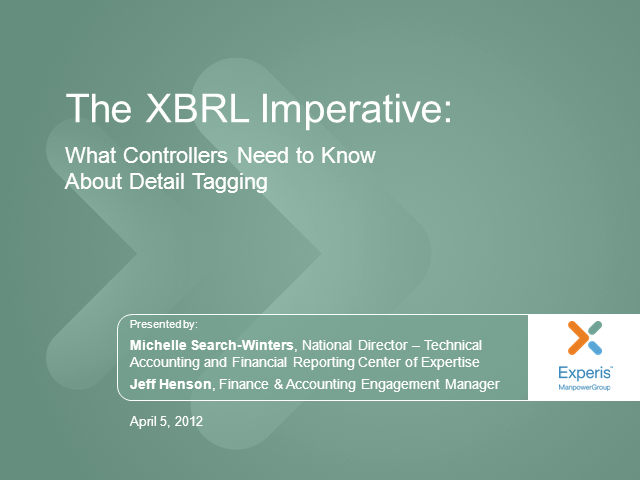 Thousands of companies will implement detail tagging in their XBRL filings for the first time in 2012. The addition of so many new detail taggers will put additional demands on XBRL implementation resources that are already stretch thin. An early start and advanced planning is needed to ensure that XBRL formatted SEC filings are completed on time and in a high quality manner. As U.S. SEC registrants implement the SEC’s interactive data (XBRL) filing requirements, they are learning that detail tagging footnotes is a more exhaustive and time-intensive process than expected. Additional compliance complexities arise as leading practices, core technologies and service provider procedures continue to evolve during the busiest XBRL compliance cycle yet. In this session you’ll learn how to manage a high quality XBRL compliance program.